Vegan gardeners!! I have great news! There IS a veganic fertilizer now available, it works, and is named Grow Veganic. If you’re impatient to order, go here: www.growveganic.com, otherwise, read my review below. What is a veganic fertilizer? 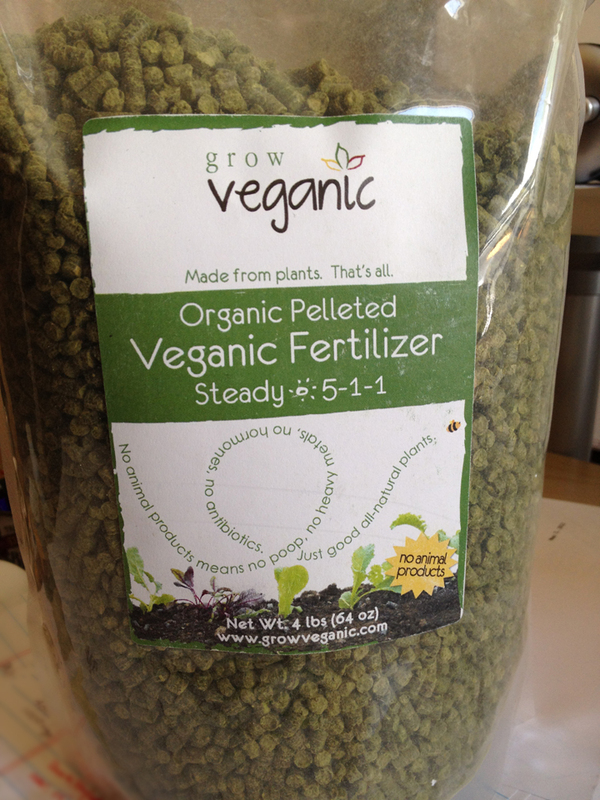 I received a test bag of Grow Veganic’s Steady 5-1-1- fertilizer, a slow-release, pelleted form on June 6, 2012. Of course, knowing that it would take a while to try it out and therefore review it, I immediately sprinkled a liberal 4 handfuls in a giant pot of some suffering coleus on the front porch. Why were they suffering? Well, I was cheap and planted them in decrepit (overused, nutritionally depleted potting soil from the past two years) adding straight-up coir to top off the pot. It’s a HUGE pot so I didn’t really have the funds to buy enough of the good stuff to fill it. Seeing as it’s also a pot , therefore lacking in earth worms, this meant that it wasn’t going to provide the coleus with much in the way of nutrition. The plants were doomed. I wish I’d taken a before shot but I did not. I can tell you that the coleus came from clippings I had in a juice glass in the kitchen window. Meaning, they weren’t more than 8 inches tall to start. And they were all wet roots, starving for nutrients. Sunizona Family Farms is a 20 acres small farm in Southeast Arizona. After launching as a conventional farm, they quickly developed a passion for organic farming. As they say, they then had an “aha” moment realizing they could provide nutrients without animal by-products. They now offer a fully veganic CSA, the first one I’ve heard of. Knowing they couldn’t ship their produce to everyone, they began packaging their own fertilizer so anyone anywhere can grow veggies with a clear conscious. You can order it here. Both organic and conventional fertilizers typically rely on by-products from animal agriculture, usually factory farms (CAFOs). If you’re a vegan, or if you just don’t want to use animal-derived fertilizers, having an animal-free option can be important. Additionally, a team of researchers at University of Minnesota recently demonstrated that antibiotics commonly administered to animals on CAFOs are absorbed—by way of manure fertilizer—into several vegetables such as green onions, corn, lettuce, cabbage, and potatoes. While they did not test all vegetables grown by home gardeners and farmers, the research results were enough to question the safety of manure used in food crop production. In addition to the ethics of CAFOs, I for one don’t want that in my food. There are several studies conducted by UofM, here is one of the two I’ve read (both are essentially the same; testing for various antibiotics uptaken into various crops, with varying results depending on the specific antibiotic class. ): Kumar, K., Gupta, S. C., Baidoo, S. K., Chander, Y., and Rosen, C. J. 2005. Antibiotic uptake by plants from fertilized soils. J. Environ. Qual. 34:2082–2085 (2005). NOTE: At the time of the research, K. Kumar, S.C. Gupta, Y. Chander, and C.J. Rosen, were with the Department of Soil, Water, and Climate, and S.K. Baidoo was from the Department of Animal Science and Southern Research and Outreach Center, University of Minnesota. I have not followed up to see where they are currently. So, for folks who don’t eat a lot of vegetables, this may not raise a red flag. But to those of us who do or are vegans, … well, it’s something to consider. I’m so glad you mentioned this earlier this summer. Next year, I’ll be buying more of it. yeah, I’m going to be stock up on it as well. The burst of the coleus on the front porch is nothing short of amazing. I really need to pose The Husband next to that planter so y’all can see scale.